Even a lost light can be a beacon. I have good news to report. Lost Light has just been accepted into the Atlanta Underground Film Festival! While there are still changes to the lighting I wish to make, (I have been delayed in making those changes due to some computer problems I have just managed to fix), I will be submitting the film as is to the festival. According to the email I received, only about 10% of the films submitted were accepted! I am very proud of everyone involved in the film, and can't wait to see it on the big screen. The festival runs October 11th-13th, 2014. See you all there! So the film has been finished for what the class requires. I would love to go back and re-light a lot of this, since I didn't get the time to really focus on lighting with all the deadlines I had as the director. If I find the time, I update many of these scenes and post updates. I have received good feedback at SIGGRAPH about what I can do to improve the film, so when I have the chance, I will work on this some more. Hopefully I'll find some time and be able to implement these changes to the lighting. If and when I do, I will post updates. Well I've gotten to picture lock. Technically the look of the film, all animation and textures and such, should be done. In reality, I have lots left to change, including animation and timing, textures, lighting, and more importantly setting up for render passes. I need to have render passes for the next steps because I am compositing visual effects of the ocean and particle trails into the film and need to have the elements separated. I also have long render times for a lot of this, and need to make the scenes more efficient, and separating things into passes will help me get them rendered on the render farm (which has a 2 hour per frame time limit). So for now I have the new animatic with timing and textures, but I have a long way to go in the next few weeks. Also, I got in touch with a guy, Chris Klaxton, to compose some music for me. Can't wait to see what he comes up with! I am finally in the final stage of development. In these last few weeks, I will be texturing, lighting, rendering, compositing, and adding special effects, as well as color grading and finalizing my credits. I am really excited about this film, but this quarter got off to a slow start for me thanks to an unexpected illness. Luckily, I'm back on my feet now and ready to hit the road running. One of the changes I am making is adjusting models to fit the elongated and eschewed look. 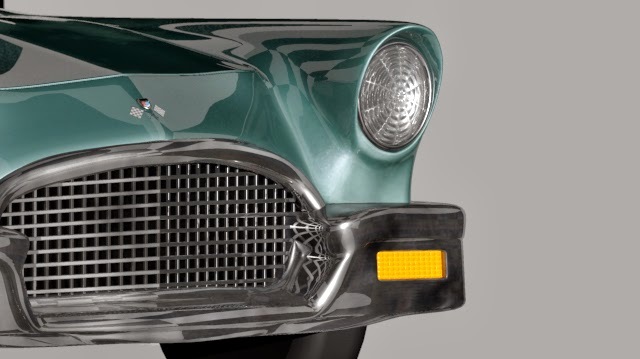 We have also pulled references from films in the 1950's to get an idea of the colors, look, and styles they used. I wanted to share one of the images I've been working on. While this is only a test with preliminary test lighting and a simple checkered environment, I can see the direction I am going for in this one and I really love the look of it. I will post more soon! For the past few weeks, I have been busy working on organizing my team and getting my texturing and animation under way. One part of this was to prepare an updated mood board that shows inspiration and reference material. I also made 3 Style Frames, which are sort of like making a goal for where you want the look of the film to go. So without further ado, my Style Frames and Mood Board. 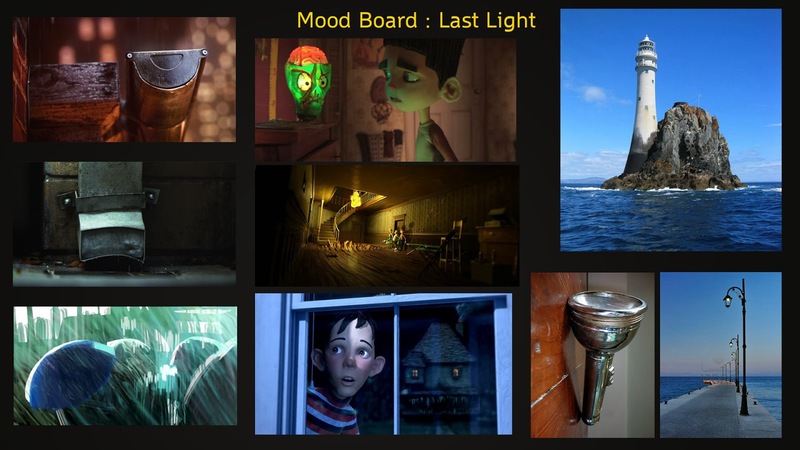 Some inspirations come from Pixar's Blue Umbrella, Laika's Paranorman, and Sony's Monster House. Opening scene where the sun sets and "Ray" is born. Ray ends up inside this office before getting frustrated at the desk lamp. As Ray gets exhausted, he gives it one last chance. 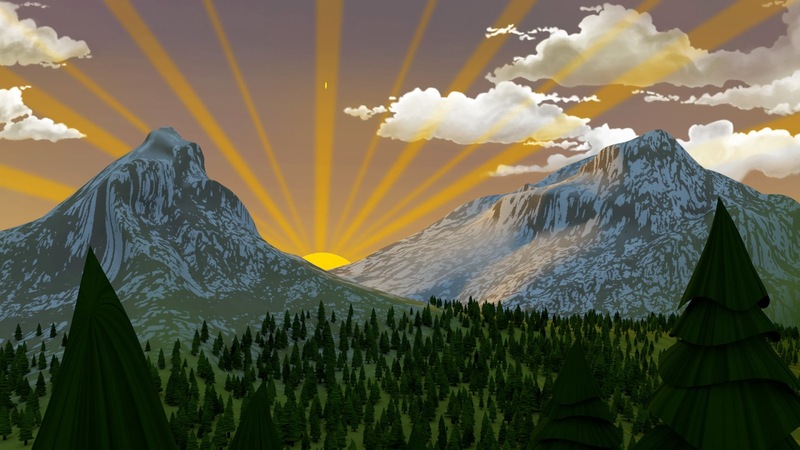 Opening shot, forested mountains and sunset with rays of light and particles. 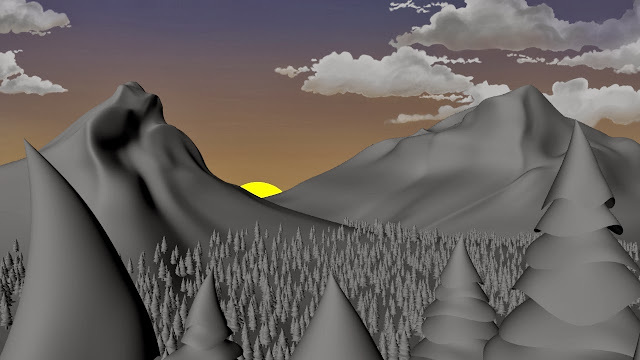 Modeling finished: forest, mountains, sun. Repair any penetrating geometry in the forest. Character close up as Ray comes to life. Add more elements in background. 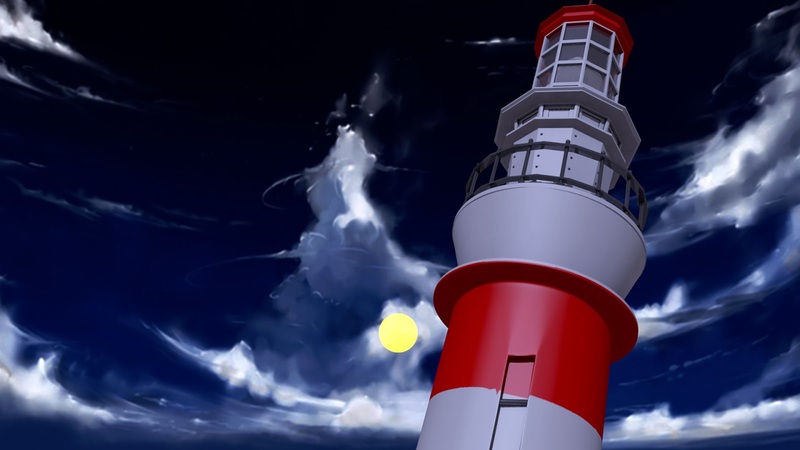 Ray travels toward the city past a coastline and lighthouse. Modeling character and lighthouse done. Add more foliage to cliffs. Ray sees street lights as they get lit up by the other rays of light. Add more objects in BG. Add more geo to background. Ray tries to light up the street lights himself but is beaten to the punch. Ray tried one more time but the light turns on by itself. Remember to make electric light green and add sound. Consider adding geo in the BG. Ray misses the green light. Street scene where Ray tries to light up a car headlight but is blasted by the light instead. Make sure no BG matte painting is needed. Church scene, where Ray is beaten to votive candles by his brethren. Consider adding more candles in background for lighting. Office Scene where Ray sees the desk lamp but it flickers on and he gets frustrated and throws it off the desk. Use particles as sparks to show frustration. Consider building of some kind in BG. House scene, where Ray is trying to light a candle. Consider adding sparks as he hits the glass. Ray runs into a guard in an alley with a flashlight. Fix rig on guard if possible. Keep Ray at the same point in the start of this scene as where he ended in the previous shot (transition). No particles from Ray here. Ray travels by the coast and sees the lighthouse. Figure out the water here. Ray is dim and flickers. Ray flies up the side of the lighthouse. Ray looks around and cautiously goes inside the broken glass. Shot of the lighthouse as Ray’s light slowly dims down to nothing and the scene darkens drastically before a single flash of light emits from the lighthouse. Final shot as the lighthouse lights up and illuminated the dark cold environment with a bright warm light. Set in the 1950's along an American coast line, the sun sets, and the last ray of sunlight flies out. While competing against his fellow rays of light as well as electric bulbs, the last ray must look for a place to stay and light up for the night. 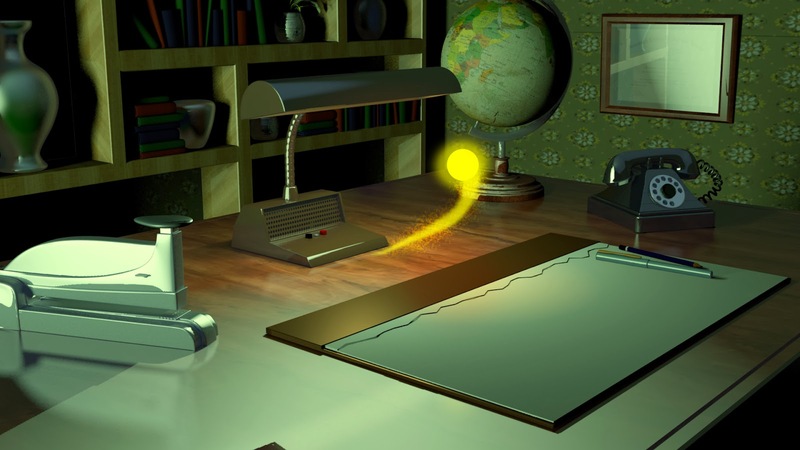 This 3D animated short will be using complex shading and lighting in a stylized world while featuring a simple piano soundtrack with environment sound effects. Thanks for taking a look at my blog for my film. This is the beginning of a new year, and a new quarter. The goals for this quarter are to complete the rigging, animation, and texturing, and to start on lighting and continue with the sound and the matte paintings in the background. I also plan to complete several style sheets to really nail down the final aesthetic of the film. I have a few new objects to place into the various scenes to help populate the environment, which should be done this week. I've also brought on some more people to help with the film, including Eric who will help me later on with the particle effects. Another change on my blog you will notice is that the animatic will now have a password attached to it. I apologize to anyone who wanted to see this, but my goal in the next few months is to start making my rounds in various film festivals. So keep an eye open. I will post more as the project progresses.